In a tragic accident, a young woman fell into an open elevator shaft at Fenway Park. The woman was taken to the hospital and suffered serious injuries after walking into the open-doors of an elevator shaft and falling 20 to 30 feet. 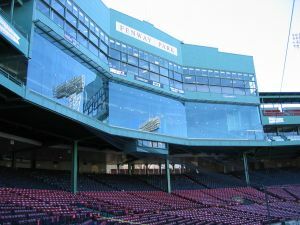 This premises liability case could result in civil claims against all responsible individuals and entities, including the owners, management, or maintenance companies of Fenway Park. This case is under investigation and authorities are still not sure of the causes. Premises liability cases arise when a residential or commercial property owner fails to cure dangerous conditions, warn entrants of defects, or when failure to maintain causes an injury or fatality. Our Boston premises liability and personal injury lawyers know elevator accidents like these are more common than many people realize. And among the most common causes is a person stepping through the doors into an empty elevator shaft. According to the Boston Herald, the 22-year-old victim fell down the elevator shaft after the doors opened on floor 4. The woman stepped into the elevator shaft and fell 20-30 feet. Firefighters ran to upper floors and saw her body on the elevator from above. Immediately, they cut the power and worked quickly to rescue her. Without using a ladder, the rescuers were able to use a chair and climb through a hatch in the roof of the elevator. The rescue team secured her neck to make her immobilized and brought her down through the roof of the elevator. The woman was unconscious and unresponsive and it was clear that she suffered serious injuries. Immediately after she was discovered, rescue crews transferred her to Beth Israel Deaconess Medical Center. Statements from the Red Sox indicated that the case is under investigation by the Massachusetts Department of Safety and the Boston Police Department. The agencies were not making any specific statements about the condition of the victim or the ongoing investigation. A state elevator investigator has been placed in charge of the accident to determine the cause and to ensure repairs. The elevator is currently out of service and will not be reopened until the investigation is complete. Liability in this case will depend on the cause of the accident and whether the agencies were negligent in repairs. If there were known and uncured defects with the elevator the owners and property management companies can be held liable. According to a spokesperson for the Massachusetts Department of Public Safety, there were no records of the last inspection of the elevator. Safety and maintenance practices of the organization will also be compared to industry standards to ensure necessary upkeep. The accident remains under investigation and the doors have since been bolted shut on the elevator shaft. In the event of a personal injury related to individual or entity negligence, victims should consult with an independent investigator who can review all evidence, determine liability, and hold all parties accountable. Legal action in such cases can ensure a just recovery for the victim and prevent future accidents, injury, and death.